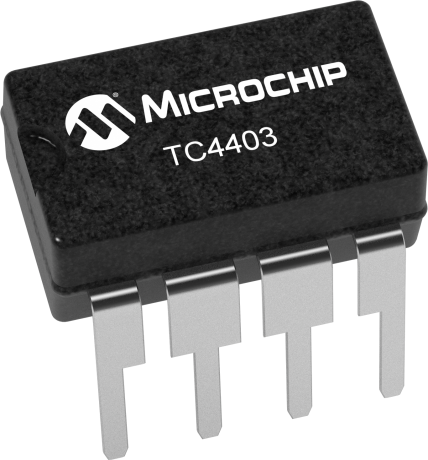 The TC4403 is a modified version of the TC4425 driver, intended to drive floating or isolated loads requiring high-current pulses. The load is intended to be connected between the outputs without other reference to supply or ground. Then, only when both logic inputs and the VDD input are energized, is power supplied to the load. This construction allows the implementation of a wide variety of redundant input controllers. The low OFF-state output leakage and independence of the two half-circuits permit a wide variety of testing schemes to be utilized to assure functionality. The high peak current capability, short internal delays, and fast output rise and fall times ensure that sufficient power will be available to the load when it is needed. The TTL and CMOS compatible inputs allow operation from a wide variety of input devices. The ability to swing the inputs negative without affecting device performance allows negative biases to be placed on the inputs for greater safety. In addition, the capacitive nature of the inputs allows the use of series resistors on the inputs for extra noise suppression. The TC4403 is built for outstanding ruggedness and reliability in harsh applications. Input voltage excursions above the supply voltage or below ground are clamped internally without damaging the device. The output stages are power MOSFETs with high-speed body diodes to prevent damage to the driver from inductive kickbacks.